On March 8 President Trump announced that he was imposing tariffs of 25 percent on all steel imports and 10 percent on all aluminum imports from all countries except Canada and Mexico (White House 2018a, 2018b). The crisis that preceded this action is driven by massive amounts of excess capacity in global steel and aluminum production, which has resulted in import dumping by a number of countries (China being the most significant one). The justification for the president’s imposition of tariffs comes from the U.S. Commerce Department’s investigations under Section 232 of the Trade Expansion Act, investigations which found that unfair steel and aluminum imports “threaten to impair the national security of the United States” (U.S. Department of Commerce, Office of Public Affairs 2018). The Francois and Baughman (2018) results are driven overwhelmingly by a nonstandard modeling assumption: that growth in the U.S. economy is constrained by aggregate demand. This is not how the vast majority of trade modeling analyses are done. Even with the assumption of demand-constrained growth, the Francois and Baughman (2018) results are totally implausible. There is no credible evidence that these tariffs could drag on growth in demand anywhere near enough to generate employment losses as large as the authors report. Though we would welcome broader methods of trade modeling if done in good faith, the use of demand-constrained growth in trade modeling only when it supports arguments against tariffs undermines those arguments. In many contexts, one could see the introduction of demand-constrained growth as a useful advance in trade modeling. However, Francois and Baughman (2018) embrace this assumption of demand-constrained growth when it drives up net employment losses in their model but ignore its implications otherwise. In fact, nearly all of the positive arguments in favor of trade liberalization (i.e., low tariffs) rely on assumptions that the economy is not demand-constrained and sits at full employment. Previous efforts to look seriously at what demand-constrained growth could mean for trade policy have been ignored by the same analysts and writers claiming that steel and aluminum tariffs would significantly harm U.S. employment. Capaldo at al. (2016), for example, allowed for demand-constrained growth in a model of the Trans-Pacific Partnership (TPP) and estimated that the TPP would slow U.S. growth measurably in such a model. Yet their model was either ignored or actively criticized as unrealistic by many who now tout the Francois and Baughman (2018) results and criticize the steel tariffs. Relaxing the assumption on demand constraints in the Francois and Baughman (2018) model and putting their model on an apples-to-apples footing with the vast majority of trade policy modeling reduces their estimate of job losses by roughly 97 percent—dropping estimated jobs lost from 146,000 to under 5,000. While Francois and Baughman (2018) look at the effects of raising tariffs on steel and aluminum, the textbook case for arguing that lowering tariffs will boost economic efficiency relies on the assumption that the economy operates at full employment, meaning that overall economic growth is constrained only by growth in the economy’s productive capacity and not by spending decisions made by households, businesses, and government. This means that economic growth is not constrained by too-slow growth in aggregate demand. This full employment assumption lies behind the vast majority of analyses of trade policy and is a necessary condition for many of the findings that lower tariffs boost economic efficiency. Here, t is the percentage tariff, m is the share of imports in the nation’s gross domestic product (GDP), and e is the elasticity of demand for imports with respect to price. Given a 25 percent tariff, a steel imports share of the economy of 0.2 percent, and a generous elasticity of demand of 3, this implies that the steel tariffs would lead to an economic loss of roughly 0.01 percent of GDP. Given a rough rule of thumb for converting GDP gains or losses into jobs that says each job “costs” roughly $150,000 of GDP, this implies job losses of about 15,000, or about one-tenth the size of those estimated by Francois and Baughman (2018). Examination of the assumptions used by Francois and Baughman (2018), a review of closely related studies on the economic effects of the 2002 steel safeguard (Section 201) tariffs, and reviews of other related research reveal that Francois and Baughman (2018) have effectively put their thumb on the scale to generate distorted estimates of the jobs displaced by steel and aluminum tariffs. 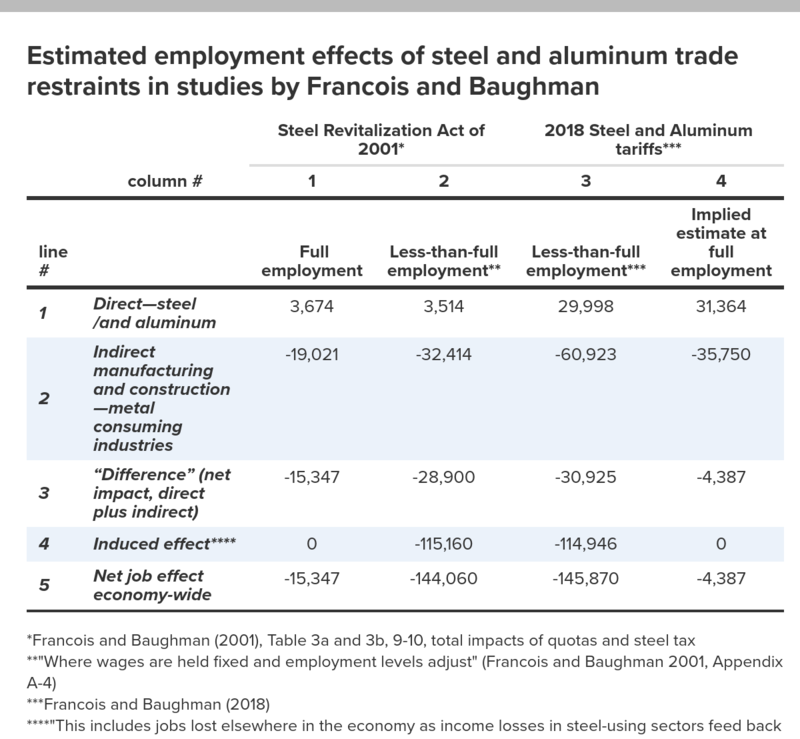 Francois and Baughman (2018) used a computable general equilibrium model (CGE) to estimate the employment impacts of steel and aluminum tariffs. As noted earlier, such models usually assume that the economy is at full employment and examine the impacts of trade policy changes on output (GDP), welfare, and the distribution of employment across industries. In contrast, Francois and Baughman (2018) assume that wages are “sticky,” “meaning that changes in demand for labor (positive or negative) are first reflected in changes in employment rather than changes in wages (Francois and Baughman 2018, 5).” This opportunistic shedding of the traditional full employment assumption has the effect of maximizing estimated job losses in their CGE model. The importance of this assumption can be seen by running the exact same model as Francois and Baughman with the traditional full employment assumption. In this case, fewer than 5,000 net jobs are lost due to steel and aluminum tariffs, a 97 percent reduction in Francois and Baughman’s 2018 estimate that the steel and aluminum tariffs will eliminate 146,000 U.S. jobs. As we noted earlier, abandoning the full employment assumption is not standard practice in trade policy evaluation—it is only done quite rarely. Further, once one abandons the full employment assumption, the case that tariff cutting is efficient cannot be axiomatically proved.1 One could make a case that the entire field of trade policy modeling should start incorporating the possibility of demand-constrained growth. But this should be done carefully and with well-reported results on how this new assumption affects all aspects of economic outcomes of tariff changes. In contrast, the Francois and Baughman (2018) is a short issue brief that only highlights the job outcomes; it doesn’t even report the change in GDP stemming from the tariffs. This failure to report the GDP change is telling. To support their claim that the proposed tariffs would reduce jobs by 146,000, they need a reduction in GDP of roughly $18 billion stemming from the tariffs. This is extremely unlikely, for two reasons. First, the tariffs are small relative to the overall economy. Second, tariffs do not just reduce demand by putting upward pressure on import prices, they also boost demand by inducing consumers of steel and aluminum raw and finished goods to switch from purchasing foreign-produced goods toward purchasing domestically produced output (expenditure switching). These cross-cutting effects mean that tariffs could well boost, not reduce, aggregate demand. The size of the implicit “tax increase” stemming from the tariffs is roughly $7–10 billion. Macroeconomic multipliers on taxes rarely exceed 1.2 Further, this drag on demand from higher taxes will be counterbalanced by boosted demand for domestic rather than foreign steel. All of this means that a GDP response large enough to be consistent with the Francois and Baughman (2018) job estimates is implausible. In summary, Francois and Baughman (2018) adopt nonstandard methods and far-too-large parameters linking tariff increases to changes in aggregate demand. In the next section we discuss how the Francois and Baughman (2018) results continue a history of the authors providing inflated estimates of the effects of steel tariffs. In March 2002, President George W. Bush imposed broad “safeguard restraints” on most steel imports, including (in the first year) a tariff rate quota on steel slab (with tariffs of 30 percent above the quota), a flat tariff of 30 percent on most basic steel products (plate, hot- and cold-rolled steel, coated steel products, and hot- and cold-bar steel), and tariffs of 8–15 percent on most downstream products (rebar, tubular and other welded products, fittings, and stainless products, other than oil country tubular goods) (USITC 2003, 1–3). Trade restraints were initially imposed for a period of three years, but were abolished in December 2003 after the European Union prevailed in a World Trade Organization dispute resolution against the United States (Scott 2018). Francois and Baughman (2001) prepared a study of the economic impacts of steel trade restraints similar to the proposed Section 201 steel tariffs.4 This report is quite similar to their 2018 study of the impacts of steel and aluminum tariffs, but differs in one important respect. Two alternative employment impact scenarios are presented in the 2001 study. The first assumes “flexible wages and full employment,” while the second assumes “limited labor market flexibility and unemployment… where wages are held fixed and employment levels adjust” (Francois and Baughman 2001, Appendix A-4). Comparison of the results under these two scenarios allows us to precisely examine the impacts of assuming high unemployment in their model, holding all other data and assumptions used in the model constant. These employment results are discussed below. Regarding the overall impacts of the 2002 trade restraints, and Francois and Baughman’s preliminary assessment of the costs of trade restraints in 2001, a more sophisticated model by Lee and Van der Mensbrugghe (2005) found a net welfare gain of 0.0025 percent of GDP and that real GDP decreased by -0.0006 percent.5 Thus, the estimated effects on the U.S. economy were extremely small. Given GDP growth and the greater diversification of industries, particularly in high-tech and service sectors that do not consume significant amounts of steel, a tariff would likely have an even smaller impact on the broader economy today. As noted above, the USITC (2003) also used a CGE model to estimate the economic impacts of the steel tariffs (which were in effect from March 2002 through December 2003). The USITC estimated that “the effect of the safeguard measures on the U.S. welfare ranged from a welfare gain of $65.6 million to a welfare loss of $110 million…and an estimated annual GDP loss of $30.4 million” (emphasis added) (USITC 2003, ix). Thus, the Francois and Baughman (2001) GDP estimates are several orders of magnitude larger than the official estimates of the USTIC (2003). Using its own CGE model, the USITC found a net decline in labor income of $386 million, equivalent to the loss of 10,365 jobs (Ferry 2018). Francois and Baughman (2001) prepared two estimates of the employment impacts of steel trade restraints, as noted above (assuming full employment, and assuming sticky wages and high levels of unemployment). Each assessment includes three types of job displacement, as shown in Table 1, which also includes comparable estimates of the employment impacts of the proposed Section 232 steel and aluminum tariffs of 2018, discussed below. The first component of the employment impact is the direct effect of trade restraints in the steel industry (or steel and aluminum, aka “metal,” in Francois and Baughman 2018), which are positive (import restraints boost domestic production of the competing like products). Note that the direct employment impact is slightly higher under full employment, presumably based on higher levels of underlying domestic demand for steel products. The second component of the employment impact is the indirect effect on steel-using industries such as fabricated metals, motor vehicles and parts, other transportation equipment, electrical machinery, and construction (the only nonmanufacturing, major steel-consuming sector). Note that jobs displaced in steel-consuming sectors are about 70 percent higher in the “less-than-full employment” scenario (column 2), 19,021 versus 32,414 jobs, presumably as a result of weaker labor markets. This factor is considered below in the analysis of Francois and Baughman’s 2018 assessment of the employment impacts of the proposed Section 232 tariffs. The third line in table 3 is the “difference” or net impact of trade restraints—the sum of the direct plus indirect effects. The fifth line in the table (for the “less-than-full-employment” scenario) includes estimates of the net job effect economy-wide (Francois and Baughman 2001, Table 3b, 10). The table note indicates that this line includes “jobs lost elsewhere in the economy as income losses in the steel using-sectors feed back through the rest of the economy.” We present this “induced effect” in line 4 in Table 1; it is simply the imputed difference between the total, economy-wide impact of the trade restraint and the “difference.” The induced effect is zero in the full-employment model. It is important to note that the induced effect in the “less-than-full employment” scenario in Francois and Baughman (2001) implies a “respending multiplier” of 4.0, which is quite large (that is, there are 4 additional jobs for each direct or indirect job displaced). The typical range for macroeconomic respending multipliers estimated by the Congressional Budget Office is in the range of 0.2 to 1.8 (Bivens 2014, Table 4, 19). The employment impact assessments in Francois and Baughman 2001 provide a very useful framework for evaluating their estimates of the employment impacts of proposed Section 232 steel and aluminum tariffs. One of the major problems with Francois and Baughman’s 2018 study is that it fails to explain “a number of modeling choices” (Ferry 2018), including key modeling parameters such as substitution elasticities (see, for example, Francois and Baughman 2001, Appendix Table A-1, 7) and basic model input data. Comparison of the results of the two employment scenarios in Francois and Baughman 2001 provides a helpful framework for analyzing the factors contributing to the large job loss estimates in Francois and Baughman 2018. Table 1 provides the information needed for this analysis. The direct effect of the 232 tariffs will support 29,998 steel and aluminum jobs, as shown in column 3 (reproduced from Francois and Baughman, 2018)). Indirect effects should include jobs lost in steel-using industries that see cost increases that reduce demand for their output, as well as the net effect on “induced” jobs. These induced jobs are the result of abandoning the full-employment assumption, and include jobs in the economy that rely on spending by steelworkers newly employed because of the tariffs as well as spending by workers in steel-using industries who are displaced by the steel tariffs. If we make an extreme assumption that all job losses in the rest of manufacturing and construction are strictly “using-industry” losses, this yields a loss of steel-using jobs of roughly 61,000 jobs. The direct plus steel-using effects hence sum to roughly 31,000 jobs lost. The rest of the estimated jobs displaced in Francois and Baughman (2018)—115,000 jobs—appear to be the result of pure “induced” or “respending” effects (line 4).6 Thus, there are 3.7 “respending” jobs for every “direct and indirect” job displaced in the less-than-full-employment” model. This means that at least 78.8 percent of the estimated 145,870 jobs displaced are due to Francois and Baughman’s assumption on demand-constrained growth, and to their excessively high parameter choice for “respending” multipliers. However, looking at their previous work it becomes clear that even more of the total job loss is driven by their assumptions on demand-constrained growth. Our analysis above assumed that all jobs lost in manufacturing sectors aside from steel and aluminum, as well as all jobs lost in construction, were the result of steel tariffs raising costs in steel-using industries. But some of these losses were likely themselves induced, and not the result of cost pressure. In their earlier work, Francois and Baughman (2001) estimated that about 70 percent more jobs would be lost in steel-using industries at less-than-full employment (columns 1 and 2). This means that making the conventional full employment assumption would reduce job losses in steel-using industries from 60,923 jobs to 35,750 (or approximately 41.2 percent), as shown in row 2, columns 3 and 4. In addition, slightly more jobs would be supported in steel and aluminum industries, assuming a fully employed economy. Thus, fully adjusting the Francois and Baughman (2018) results to eliminate the effects of less-than-full-employment bias could reduce estimated job losses by nearly 97 percent, as shown in column 4. Hence, by using nonstandard labor market adjustment assumptions, Francois and Baughman (2018) would appear to overstate potential job losses associated with steel and aluminum tariffs by a factor of 30:1. Prior research by the U.S. International Trade Commission (2003) and by Lee and van der Mensbrugghe (2005) has shown that Francois and Baughman’s prior estimates of the costs of steel trade restraints in 2001 vastly overstated the costs of the 2002 steel trade restraints. Additional analysis of the employment impact assessments in Francois and Baughman (2001) is developed here to show that the vast majority of the estimated employment impact of both the 2002 steel safeguard measures, and of the proposed 2018 Section 232 tariffs, are the result of nonstandard assumptions regarding constraints on economic growth and subsequent modes of adjustment in the labor market (in particular, assuming that wages are sticky and that economic growth is demand-constrained). Bringing this assumption into line with standard trade policy modeling reduces estimated job losses by nearly 97 percent. As we noted previously, if the Francois and Baughman (2018) adoption of nonstandard modeling assumptions on demand-constrained growth were part of a larger agenda to bring intellectual diversity into trade policy analysis, it could be a welcome step forward. But it would need to be a much deeper analysis to serve this goal; at a minimum it should report on effect of the tariffs on national income, not just employment. Further, there is a strong overlap between those touting the Francois and Baughman (2018) results on steel tariffs and those who criticized or ignored earlier analyses that examined trade policy under demand constraints (such as Capaldo et al. ) and found that trade treaties could reduce U.S. income and employment. This does not seem to us, then, like a step forward in doing more sensible trade policy analysis—instead it simply seems like opportunism. The author thanks Josh Bivens, Thea Lee, and John Schmitt for comments, Zane Mokhiber for technical and research assistance, and Lora Engdahl and Krista Faries for editing assistance. This research was made possible by support from the Wiley Rein LLP. 1. For an acknowledgement of the necessity of assuming full employment for proving the gains from trade, and for probably the best defense of including this full employment assumption, see the online essay by Paul Krugman, “Ricardo’s Difficult Idea,” available at web.mit.edu/krugman/www/ricardo.htm. 2. See Batini et al. 2014 on this point. 3. The welfare gain or loss is a measure of the increase (or decrease) in economic efficiency as a result of the imposition (or removal) of a tariff or other form of a trade restraint. It is usually measured as a share of GDP. The approximate economic losses associated with the steel tariff that are estimated in the background section, above , are an example of a welfare loss calculation. 4. Francois and Baughman (2001) estimated the impact of the “Steel Revitalization Act of 2001,” which would have imposed quotas on imports sufficient to reduce imports by approximately 25.5 percent (Table 2 at 7), and imposed an across the board tax on all domestic and imported steel products of 1.5 percent (to fund steel health care and other adjustment costs). 5. Welfare gains in Lee and Van der Mensbrugghe were due to terms of trade effects, reflecting the fact that the U.S. is a large country, and the reduction in steel imports reduces global steel demand and import prices. 6. Through “reduced spending for food, clothing and shelter from unemployed steel-using sector workers ultimately would have negative effects on employment in agriculture” and service industries “when the economy is not at full employment” (Francois and Baughman 2001, Table 3b, 10). Batini, Nicoletta, Luc Eyraud, Lorenzo Forni, and Anke Weber. 2014. Fiscal Multipliers: Size, Determinants, and Use in Macroeconomic Projections. International Monetary Fund Technical Guidance Note. Bivens, Josh. 2014. The Short- and Long-Term Impact of Infrastructure Investments on Employment and Economic Activity in the U.S. Economy. Economic Policy Institute. Capaldo, Jeronim, Alex Izurieta and Jomo Kwame Sundaram. 2016. “Trading Down: Unemployment, Inequality and Other Risks of the Trans-Pacific Partnership Agreement.” Global Development and Environment Institute at Tufts University (GDAE) Working Paper. Ferry, Jeff. 2018. “Steel & Aluminum Tariffs Produce Minimal Impact on Jobs, GDP: CPA Economic Model Refutes Alarmist Trade Partnership Study.” Coalition for a Prosperous America Working Paper, March 20. Francois, Joseph, and Laura M. Baughman. 2001. Costs to American Consuming Industries of Steel Quotas and Taxes. The Trade Partnership, April 30. Francois, Joseph, and Laura M. Baughman. 2018. Does Import Protection Save Jobs? The Estimated Impacts of Proposed Tariffs on Imports of U.S. Steel and Aluminum. The Trade Partnership, March 5. Lee, Hiro, and Dominique van der Mensbrugghe. 2005. “The Impact of the U.S. Safeguard Measures on Northeast Asian Producers: General Equilibrium Assessments.” In Restructuring of the Steel Industry in Northeast Asia, Hiro Lee, Eric D. Ramstetter, and Oleksandr Movshuk, eds., 152–176. Palgrave Macmillan. Scott, Robert E. 2018. Trump Must Act Now to Protect U.S. Steel and Aluminum: Administration Delays Have Already Heightened the Import Crisis for Tens of Thousands of Steel and Aluminum Industry Workers. Economic Policy Institute. Timmons, Heather. 2018. “Five US Jobs Will Be Lost for Every New One Created by Trump’s Steel Tariffs.” Quartz , March 5. U.S. Department of Commerce, Office of Public Affairs. 2018. “Secretary Ross Releases Steel and Aluminum 232 Reports in Coordination with White House” (press release). February 16. U.S. International Trade Commission (USITC). 2003. Steel: Monitoring Developments in the Domestic Industry, Steel-Consuming Industries: Competitive Conditions with Respect to Steel Safeguard Measures. Publication No. 3632. White House. 2018a. Presidential Proclamation on Adjusting Imports of Aluminum into the United States. March 8. White House. 2018b. Presidential Proclamation on Adjusting Imports of Steel into the United States. March 8.